Pranis (Templet:Tok-fr) em i kantri bilong Yurop. Emi memba bilong Yunien bilong Yurop. Kapitol na lajes siti bilong Pranis emi Paris. Ofisel tokples bilong Pranis emi Tok Pranis. Pranis em i gat 64 milien manmeri. Ol taun bikpela bilong Pranis em i Paris, Lyon, Marseille, Lille, Toulouse, Bordeaux, Nice, Nantes, Strasbourg, Rennes. Ministère de la culture et de la communication – Délégation générale à la langue française et aux langues de France. DGLF – Langues régionales et " trans-régionales " de France. Culture.gouv.fr. Retrieved on 27 January 2010. 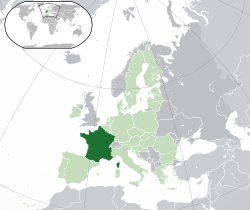 ↑ 3.0 3.1 Whole territory of the French Republic, including all the overseas departments and territories, but excluding the French territory of Terre Adélie in Antarctica where sovereignty is suspended since the signing of the Antarctic Treaty in 1959. French National Geographic Institute data. INSEE, Government of France. Population totale par sexe et âge au 1er janvier 2011, France métropolitaine. Retrieved on 20 January 2011. ↑ 8.0 8.1 8.2 Metropolitan France only. ↑ 9.0 9.1 9.2 9.3 France. International Monetary Fund. Retrieved on 26 April 2011. ↑ Human Development Report 2010 (PDF). United Nations (2010). Retrieved on 5 November 2010. This page was last edited on 27 Disemba 2018, at 13:06.